Nintendo's newest smash hit announced today-Pokemon: Tab and Pokemon: Tim! Join Pokemon Trainer Tab on his quest to gather all the Pokemon in the Merca region and wait... what is he doing to them?! OH GOD! TURN THE CAMERA OFF! TURN IT OFF! KIDS ARE WATCHIN-. Or join Pokemon Trainer Tim on his journey to find the strongest Pokemon! See how he trains his Machamp here in the Pokemon Gym! Electrolytes and vitamins? Well I hope those are visiting! And booster shots I guess? Need to stay healthy! Watch now as he spars with his friend Onyx and BY GOD HE BROUGHT OUT A CHAIR! HE'S GONNA RIP HIM IN HALF! QUICK, CUT TO COMMERCIAL! The glitz. The glamour. The Red Carpet is a symbol of all that is wrong with humanity. The cult of celebrity is a real one, and a dangerous one. It turns people into basic zombies that feed off the teat of any information about these celebs. Here's some life advice, if you ever meet anyone that watches a red carpet event hearnestly and for entertainment, just go ahead and sweep their legs and walk away. Delete all forms of contact you have with them. Any news is good news. Anything to feed the ego. It thrives off of attention. It's a parasite that lives symbiotically with all humans. In pinches and small doses it makes you feel good. But some people give it too much food, and it ends up taking over. Just the mere mention of their name will make them drool as if they were a man that's been stuck at sea for 3 weeks presented with a freshly-cooked steak. Quitters. Losers. Yellowbellies. People that give up after getting the proverbial first bump in the road. No matter what it is, no matter how lenient, there will always be those people that can't take failure. I can't imagine all the things they miss out on because of it? Do you just not drink if you can't open the bottle on the first try? What the hell do these people do with USB sticks? Those take the most tries of anything to accomplish! The iconic yellow school bus. Hasn't changed a bit since it was first invented. Still a metal deathtrap that no one gives any second thought. You'd think that in this day and age of safety and political correctness and helicopter parenting that they would at LEAST ADD SEATBELTS. But no! Still just as bumpy a ride as ever! They've still got the hump seats, the back is still where the cool kids sit, and they still get mad when you slingshot apples at the front windshield! All that and more on this week's episode. We've got voicemails, soundboards and more! 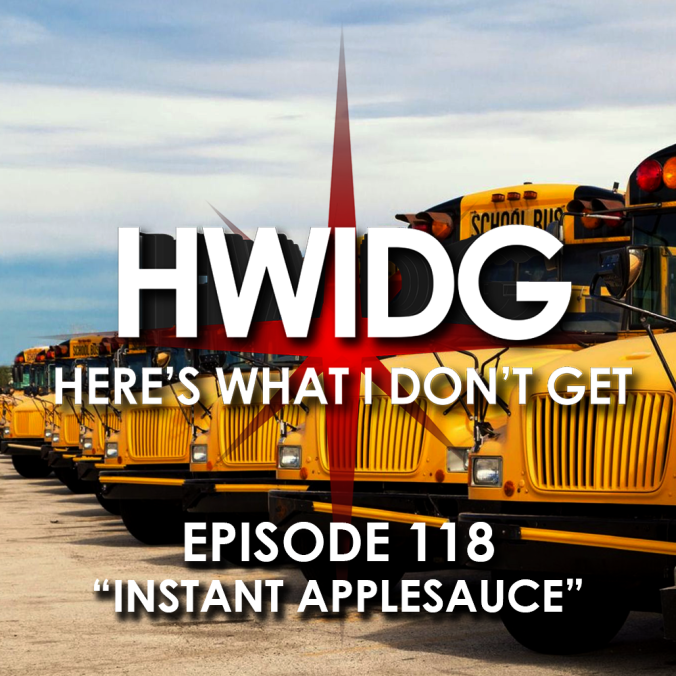 If you want even more HWIDG goodness join our PATREON, and if you wanna chat with us join our DISCORD!